I am wearing the costume. The idea came from all of the classic werewolf like in movies I have seen including underworld. 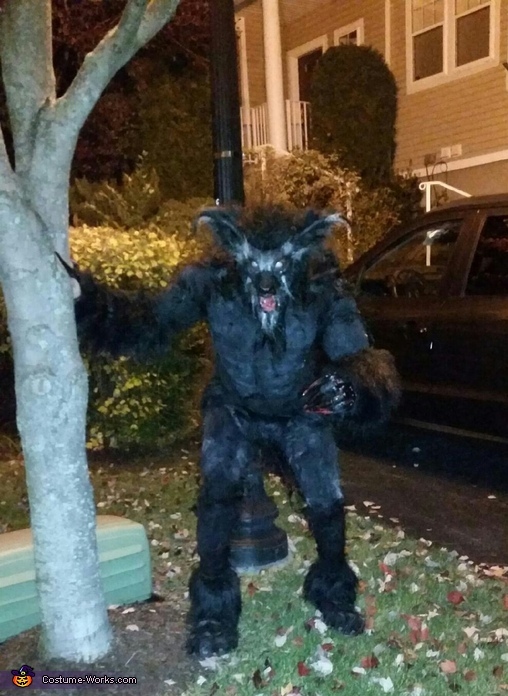 I started the costume with a cheap werewolf mask from Target I denry airbrushed it and added a lot of different color hairs Gray's whites blacks to make it look more realistic I also use a glue gun in the mouth and nose area to make it look like it was wet and salivating. Step2 was a painstaking adding foam to emulate muscles on the chest arms and leg area of black tights and top. I then inverted it and begin to spray Mount the entire costume cut hair off of fabric that I got at Michaels and glue it on with the spray mount. I then made the feet out of foam over some old shoes and made Klaus from jewelry clay and painted them black. What you cannot see is that I bowed out the legs in the back and used leather on top of the feet. The clothes were painted black from some skeleton hands. everyone loves his costume and it was extremely scary running around the neighborhood and that my Halloween party that I go to every year. Oh my costumes are made from totally from scratch and buy me myself I've been an artist my whole life and I love making things come alive. Hope you like what you see.